Hichki's greatest handicaps are its predictability and sentiment, feels Sukanya Verma. Rani Mukerji understands the plight of a problem student. She conveyed it to memorable effect as well as how to overcome it with the help of a persevering teacher in Sanjay Leela Bhansali's Black. The actress returns the favour in Siddharth P Malhotra's Hichki, where she takes on the challenge of housebreaking a bunch of disorderly slum kids to realise their academic potential. Once again, she refuses to allow her disability to interfere with her dream. Identified with Tourette's Syndrome, a neurological disorder that triggers unstoppable tics -- a condition that only intensifies when she is nervous or stressed -- Rani exhibits the body language of someone habituated to the self-governed impulses of these spasms. A loose fist instinctively forms to nudge her chin forcefully like you'd tap a stuttering radio. She bites on her pendant, fidgets with her pen, tries to see the humour in it -- the struggle feels real. Still, you never feel sorry for her even after she is rejected repeatedly at job interviews over apprehensions of her capabilities for the simple reason that she never plays the victim card. Funny when the film does just the opposite of that. Certain flashbacks hint at a traumatic childhood, a callous father, a sympathetic mom and a perceptive headmaster but they are no more than pointless details like Naina's part-time animator profile in the larger picture. 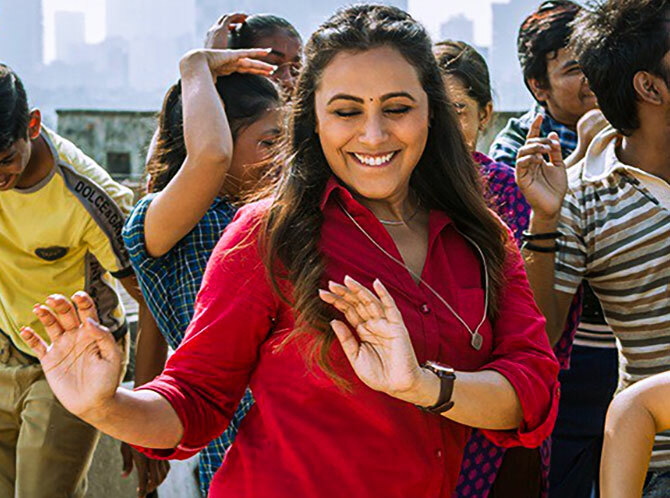 Based on Brad Cohen and Lisa Wysocky's book Front of the Class, which was previously adapted for a television movie by Hallmark, Hichki is an out-and-out Rani show. Her heft and hunger to excel in an exhausted premise infuses dynamism in a burned-out premise of dysfunctional schoolchildren and tenacious teachers. Sadly though, Siddharth P Malhotra doesn't take Hichki in any direction films of this nature haven't already been before. Hichki's greatest handicaps are its predictability and sentiment. A newly recruited teacher in a snooty convent school, rowdy kids giving a tough time, playing pranks, getting in trouble, noble new teacher taking blame, hell-bent on channelising their destructive energy and imagination for smarter objectives, almost all kids coming around except that one footage-craving twerp. Not to forget the customary rivalry of snarky privilege and social disadvantages, already articulated to perfection in Model versus Rajput. The teenaged kids in Hichki are credible, especially the one with rapping skills. Though they are wayward and gamble, smoke, drink, chop bhindis, break into rap songs and sneak in pet rats into classrooms, there's a novelty when Rani and her Tourette's Syndrome gets a taste of the ill-famed 9 F and its propensity for mischief. But when the script supresses their spontaneity to force down a done-to-death cycle of tantrums, melodrama and collective redemption, the films collapses beyond repair. You believe in the brilliance of Rani's sparkling intelligence and physical stamina through the arduous journey of straightening an unruly lot and braving a barb-ready rival sniggering at her methods -- Neeraj Kabi's starchy, suit-clad, teacher is Narayan Shankar to Rani's nonconforming Raj Aryan. But the vexing obviousness and self-pitying texture of the narrative cannot be justified by playing earnest. And that's one syndrome Hichki never gains advantage over till the end.